Copyright 2009-2015 www.hiddeninthewoods.com - Reproduction of any material on this site is prohibited without written permission. They include cartoons, a poster and each comes with a special toy for children. Move over the magazines (except the second one) to see the toy included. Special Spirou Magazine celebrating the 50th anniversary of the smurfs. This magazines released the latest Smurf comic in April 2009. 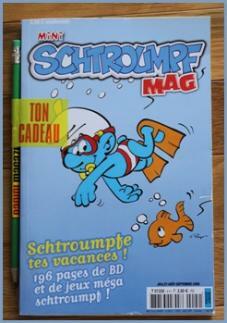 The name of the smurf comic is "Schtroumpf les Bains"